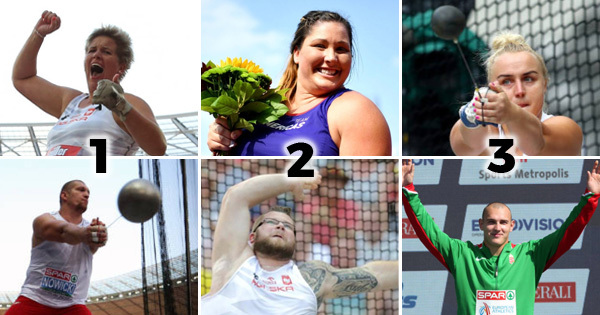 Last week we posted our hammer throw world men’s rankings and women’s rankings. Some of the other leading publications also released their rankings recently, including Track and Field News and Athletics Weekly, both compiled by expert panels. To get a picture of what the consensus rankings are, we’ve averaged out all the major rankings services, including the new IAAF ranking system. Overall, the rankings came to very similar conclusions. For example, in the women’s rankings, all four rankings included the same 10 women. On both the men’s and women’s rankings, the top three were identical in all rankings, with Poland dominating at the top. Some small deviations appeared afterwards with several athletes fluctuating a few spots between rankings and some debate about who should squeeze into the final spots of the top 10 on the men’s side. The biggest deviation came in the case of Nick Miller in the men’s rankings, who was ranked as high as sixth by the IAAF, but only 10th by Track and Field News. That is a product of his bipolar season; IAAF only considers the top results, but Track and Field News looks at the whole body of work throughout the season.